SAN FRANCISCO, LONDON – June 11, 2015 – Sonic gets by with a little help from his friends for a celebration of epic proportions. 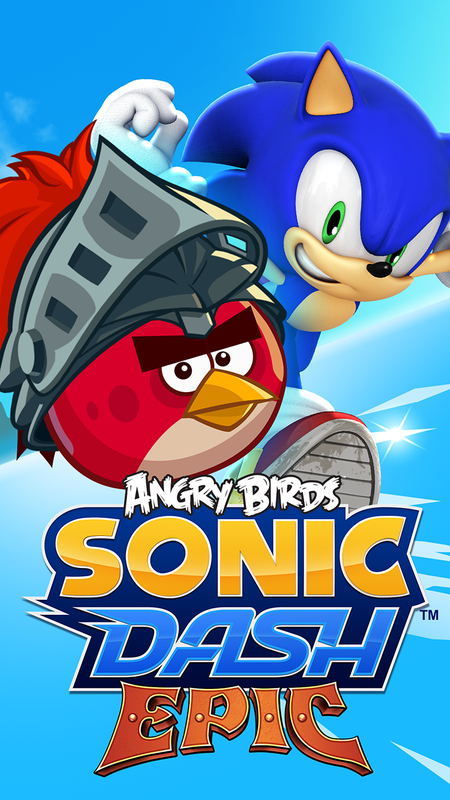 SEGA®, in partnership with Rovio Entertainment Ltd., is proud to announce that today Angry Birds™ Epic will be appearing in Sonic Dash™ for a limited time on the App Store, Google Play™, Amazon Appstore and Windows Phone Store. This in-game event will include three of the most popular and best-known characters from the Angry Birds franchise: Red, Chuck and Bomb. The Angry Birds Epic in-game event starts today and will run for three weeks. For more information on Sonic Dash, please visit the official Facebook and Twitter pages. ©SEGA. All rights reserved. SEGA is registered in the US Patent and Trademark Office. SEGA, the SEGA logo and SONIC DASH are either registered trademarks or trademarks of SEGA Holdings, Co. Ltd or its affiliates. App Store is a service mark of Apple Inc. Google Play is a trademark of Google Inc. Amazon Appstore and Windows Phone Store are service marks or trademarks of their respective owners. Angry Birds is a trademark of Rovio Entertainment Ltd. © 2009-2015 Rovio Entertainment Ltd. All rights reserved. Based in the UK and founded in 2012, Hardlight Studio is an internal development studio owned by SEGA Games Co., Ltd. Composed of a small, dedicated team with drive, passion and creativity, Hardlight focuses on making high-quality games for mobile devices. Hardlight is behind the latest critically acclaimed adventures of Sonic the Hedgehog™ on mobile platforms: Sonic Jump Fever and Sonic Dash, as well as Crazy Taxi City Rush. For more information please visit: www.hardlightstudio.com. Rovio Entertainment Ltd, the creator of Angry Birds™, is a global industry-changing entertainment media company headquartered in Finland that creatively combines digital with physical, breaking the boundaries of traditional content delivery. What started as a casual game in 2009 became an international phenomenon within a few months of its release. Today Angry Birds is the most downloaded game of all time and a globally known entertainment brand in publishing, licensing, animations, books and location based entertainment. Rovio’s animated Angry Birds feature film is slated for July 1, 2016.